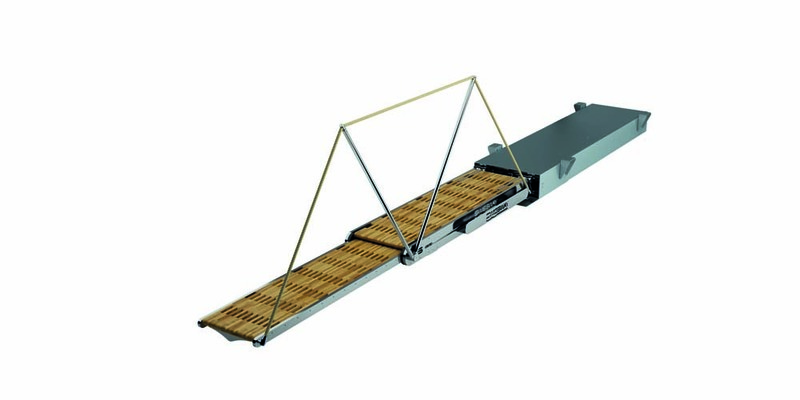 The retractable gangway Marco Polo is the middle sized fully automatic one-stage gangway from a box, intended for entering the yacht from the dock. The sliding blocks are made of anti-friction material non-hygroscopic (Delrin ®). As with the smallest box gangway the box hatch is mechanically actuated. 2300 2315 1390 925 375 330 1850 455 188 150 KG. 2300+300 2615 1690 925 375 330 2200 455 188 150 KG. 2500 2515 1490 1025 375 330 1950 455 188 150 KG. 2500+300 2815 1790 1025 375 330 2300 455 188 150 KG. 2700 2915 1590 1125 375 330 2050 455 188 150 KG. 2700+300 3015 1890 1125 375 330 2400 455 188 150 KG. 3000 2915 1690 1225 375 330 2150 455 188 150 KG. 3000+300 3215 1990 1225 375 330 2550 459 192 150 KG. 3300 3115 1790 1325 375 330 2250 459 192 150 KG. 3300+300 3415 2090 125 375 330 2700 459 192 150 KG. 3600 3415 1990 1525 375 330 2450 459 192 150 KG. 3600+300 3715 2290 1525 375 330 2850 459 192 150 KG.